Buoyed by recent growth and the release of Chromebooks for the education sector powered by A-Series processors, AMD are today launching four new 2nd Generation PRO-series Mobile APUs for the commercial sector as part of the RYZEN and Athlon product portfolios. Each is an evolution of the Ryzen PRO 2000U-series, offering more performance and battery life than their predecessors and continuing to present a genuine alternative to Intel in notebooks for business. New APUs down the AMD PRO series Mobile range sit within a tight 15W envelope, making them suitable for both mainstream and sleeker 'thin' notebooks. Despite this restriction they still offer up to four cores discrete CPUs cores and dedicated graphics for performance you can rely on day-in, day-out. Sitting at the head of the range is the new Ryzen 7 PRO 3700U, a 4-core, 8-thread design that boasts Radeon Vega 10 graphics. AMD pitch it against Intel's Core i7-8600U, itself a 4-core/8-thread chip that nonetheless has a weaker graphics processing capability. Even against the Ryzen 7 Pro 2700U, a processor with which it ostensibly shares many traits, the 3700U enjoys relevant performance gains across a variety of benchmarks. Other APUs in the range are graduated downwards to the Athlon PRO 300U, a 2-core/4-thread processor for lighter loads and more affordable configurations. For all the performance benefits of Ryzen's 12nm Zen+ architecture, it will come as no surprise that AMD's ace in the hole is their Radeon Vega graphics. The power of the solution exploits the now somewhat blurred lines between personal and business requirements for notebooks rather than merely managing that divide, and offers comprehensive hardware acceleration for a variety of tasks without impacting day-to-day productivity experiences through Office applications. Photo editing, CAD/CAM and video editing are all winners from the transition to dedicated Vega graphics. The major improvement over Ryzen 2000U-series Mobile APUs however is in the field of battery life. A generational improvement to power management means that notebooks based on the updated platform are capable of running up to 12 hours on battery alone, up from 8 hours (3700U vs 2700U). This 'all day battery life' feature will be a major factor in selling RYZEN PRO Mobile to OEMs and seeing the APUs in designs going forward. Consumers will be focussed on performance, but business and enterprise customers will be pleased to know that both security and management features extend down the PRO range rather than existing as a means of 'up-selling' higher spec'd components. Returning in this generation is AMD GuardMI technology protection. GuardMI exploits the dedicated secure co-processor to enhance security in critical roles, particularly in the form of memory encryption as a standard option down the range. While equivalents to features such as Secure Boot and enhanced OS security may be present in competing products, full memory encryption mitigates - which against cold boot attacks while also being completely OS agnostic - is only available as standard in AMD's PRO Series APUs. Other productivity features including multi-display compatibility, hardware video decode (H.265 & VP9) and 4K support are of course present. Plus, thanks to Vega graphics it's possible to take advantage of AMD FreeSync and SmartShift technologies. 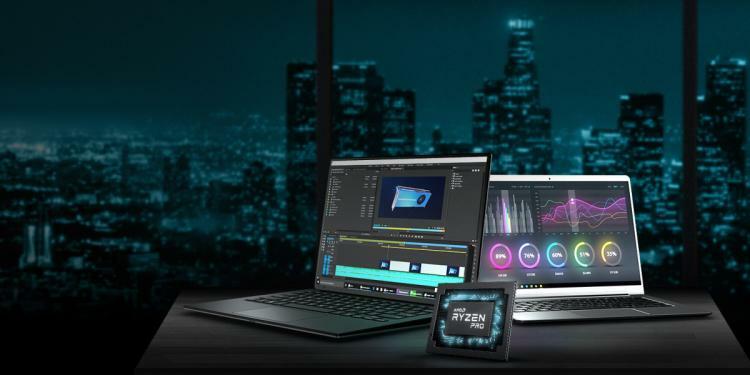 Sleek and light-weight thin notebook designs from Lenovo and HP based around the new Ryzen PRO APUs are currently in the works and scheduled to be unveiled in the near future, set to be released alongside more mainstream models. These premium designs indicate the growing confidence major OEMs have in Ryzen Pro, and the inroads AMD are making into business sector mind-share. 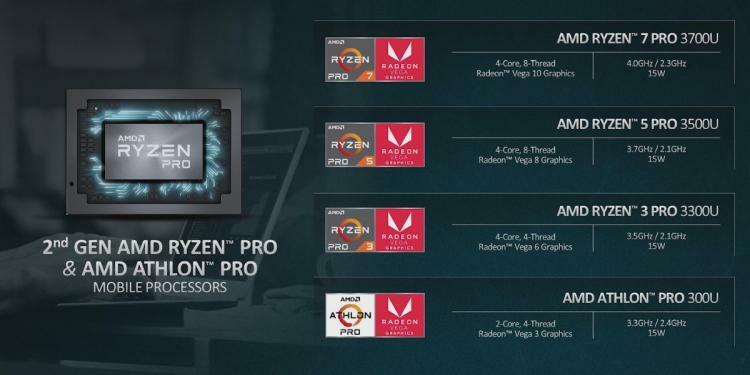 For more information visit AMD's Ryzen Pro microsite at https://www.amd.com/en/products/ryzen-pro-processors-laptop.